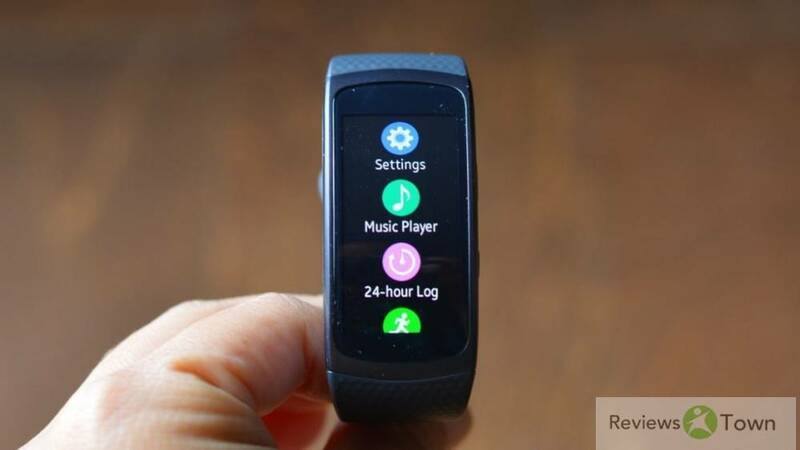 The new Samsung Gear Fit2 tracker doesn’t really fit the category assigned to it – rather, it’s a wearable that falls somewhere between fitness tracker and smartwatch. In other words, it’s not quite either. 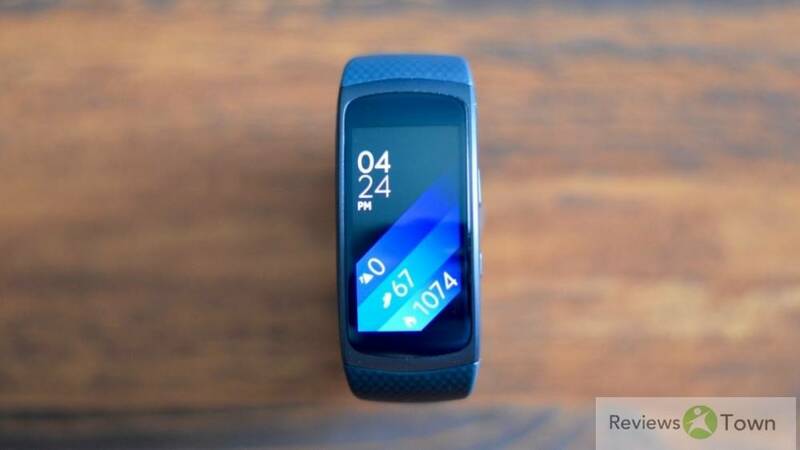 Fit2 has instead taken components from the Gear Fit and the Gear S2 to create something a little different. While the Gear Fit2 doesn’t bring anything particularly new to the concept of fitness tracking or smartwatches, it does look to be a cost effective best of both worlds. But is it the best device for you? Let’s dive in and take a look. The Gear Fit2 certainly looks more watch-like than its predecessor, and features a new textured strap that also gives it a sporty style. Beyond that, it still resembles your average, wrap-around fitness tracker. It’s really the screen that makes it stand out from the crowd. Where the first Gear Fit has a 1.84-inch curved super AMOLED display with a 432 x 128 pixel resolution, the second-gen device comes with a smaller 1.5-inch screen, but retains the curved super AMOLED display with a resolution of 432 x 216. Add in the colour touchscreen, squeeze in 322 pixels per inch and you’ve got a shining, bright and crisp display on the wrist, for better or worse. The Fit2 is also about the same size as the previous iteration – however it will now come in two sizes for different wrists: small (size of wrist: 125-170mm) and large (size of wrist: 155-210mm). It doesn’t sound like much but for people with smaller wrists, like me, it sounds like a chorus of Hallelujah. Generally, fitness trackers and smartwatches are now getting better at supplying us tiny wristed people with good fits, and a size small Gear Fit2 sits snug on my arm. The one button prong also fastens on like magic – quick, easy and hassle-free compared to the likes of Fitbits and Jawbones. Despite the variations in sizes, there’s no difference in features, display size, resolution or battery, except that the large version is slightly heavier at 30 grams while the smaller is 28 grams. There are also more colour options now as you can choose from black, blue and pink in both sizes. They aren’t the flashiest of options and while mine is black, the texture does give it an added layer to lessen the boring colours. Fit2 can also detect when you’re sleeping and napping. Fit2 then takes all this data and sticks it in a 24-hour log to give you a sense of what you’ve been up to. It even adds in times you didn’t have the wearable on so you’ll know when it wasn’t tracking. It’s a neat service to see how many calories you’ve burned from each activity and when you’ve done everything. From what I can tell, it was also pretty accurate in noting my strenuous walking paces and light bouts of activity. My experience with sleep tracking has been varied because, like the Fitbit Alta, the Gear Fit2 face will turn on when I move at night. I’d usually rip it off in a grumbly state and then realise what I’d done in the morning. I’m not sure if this was a major loss though since Fit2 doesn’t really have a dedicated sleeping app on the device, as it does for calories or steps. Instead everything syncs up to S Health. However, I was able to withstand a few nights with it on, and it did accurately track my sleep automatically. It was even able to track my naps. Water and caffeine intake are other areas you can track with Fit2. They’re basically the same app, which requires you manually record how much water or caffeine you’ve consumed – with the difference being that you’re trying to hit a target with water, and you’re trying to limit yourself with caffeine. Fit2 also checks on your heart rate every 10 minutes, but monitoring becomes continuous once you begin tracking most activities. Some activities, like rowing and the “other workout” category in the list, don’t make use of heart rate tracking, though. You can also turn it off to conserve battery life and tag manual heart rate checks as specific activities to better keep track of each lull and spike. 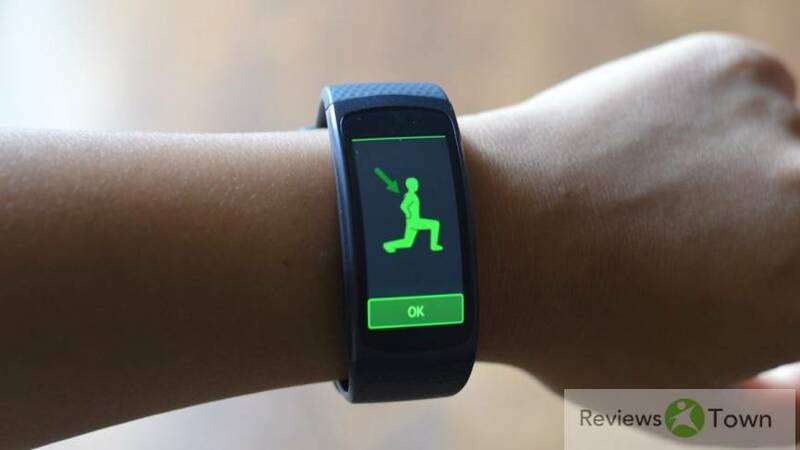 As mentioned, Gear Fit2 can auto-detect workouts, or you can manually choose one. After you select a type of workout, you can pick a goal for that workout. The goals vary but examples include target pace, duration, distance or calories – or you can choose to have no goal at all. 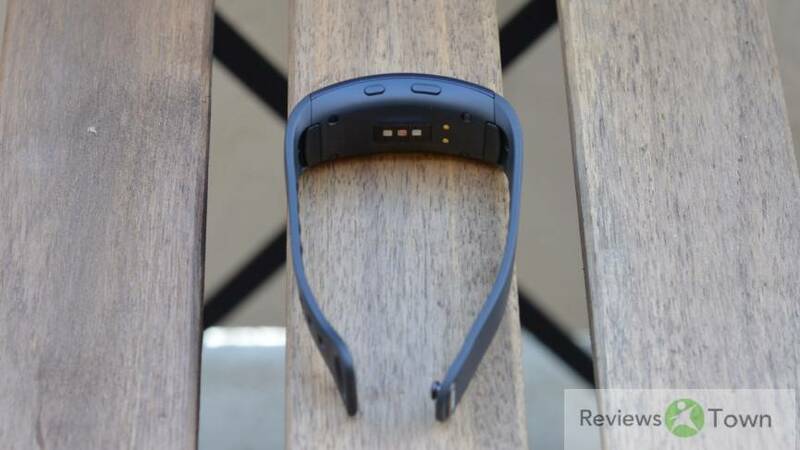 The Fit2 can even read status updates to your connected headphones at various intervals. The Fit2’s auto-tracking was fairly accurate and it was able to calculate when I started walking at a ‘good pace’ until the time I stopped. Walking around my neighbourhood and walking hurriedly to appointments at E3 would trigger the Fit2. It would vibrate, tell me I was keeping up the pace and showed a timer that had started tracking several minutes before which reassured me it was logging everything accordingly. 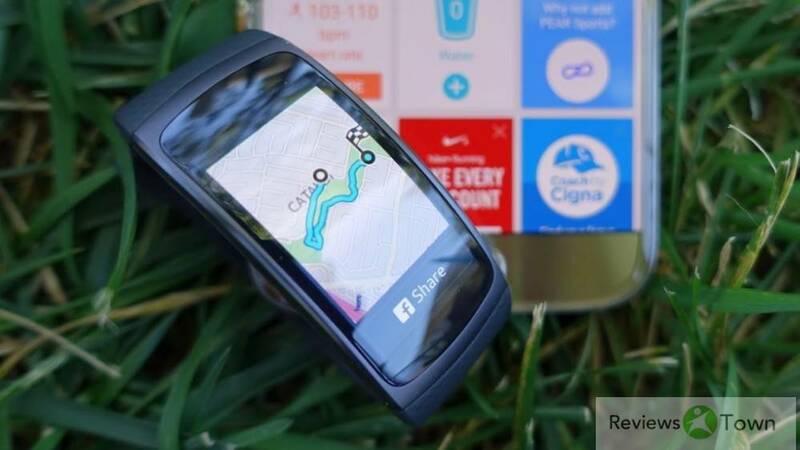 The Fit2 was able to automatically log three of my seven jogs without intervention. As an avid kayaker, I would have loved the chance to be able to track my rows along the California coast, but I was reluctant to do this given Samsung ‘s IP68 warning that the band is water-resistant but not rated for showers or swimming. As such, the rowing tracker is best used in a machine at your local gym rather than in a natural environment with water. 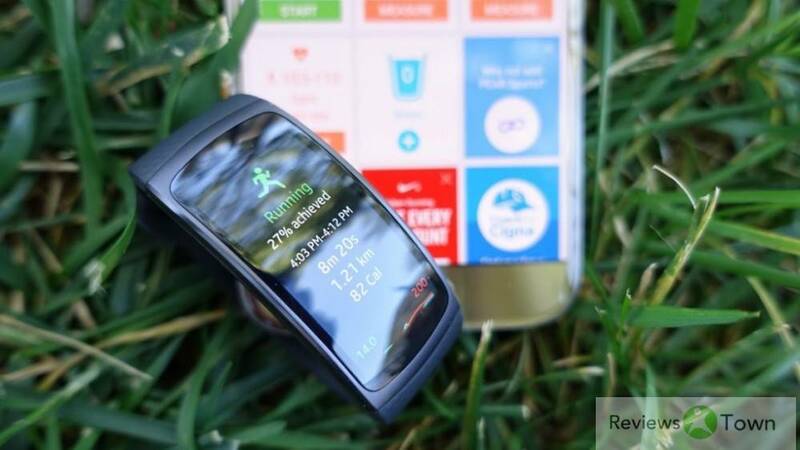 The Fit2’s fitness tracking performance may look impressive to enthusiasts looking to get into shape, but if you’re already wearing a dedicated fitness watch, you may not be so easily swayed. Aesthetically, the difference between the two devices is like comparing a Kindle e-reader to a sleek tablet. Samsung’s use of a touch interface is hit or miss for fitness. The screen turns off to save battery when you’re not looking at the Fit2, and the display is supposed to turn back on when you hold your wrist up. During my jogs, I found this to be clunky. The screen didn’t turn on the majority of the time when I expected it to, and I ended up having to push one of the buttons on the side of the band to wake up the display. Additionally, swiping through the touchscreen is cumbersome when you’re active and moving. The UI is fine if you’re stationary, but pushing a button to get your workout stats is far easier than having to precisely swipe on such a small surface. Half the time, I felt like if I wanted to do this much work with hitting a button to turn on the display and figuring out where to swipe, I might as well reach into my pocket and pull out my Galaxy S7 to check my workout on Samsung ‘s own S Health application. You’ll find 512MB of RAM and 4GB of storage, all powered by Tizen through a Samsung -made 1GHz dual-core processor in the Gear Fit2. It’s a zippy little thing that can hold a decent amount of music. Tizen, in this case, has become much better than its other forms. While simple, it’s still clean and straightforward. The interface is also vertical instead of horizontal making everything much easier to read and use. The Fit2 interface isn’t solely based on touch – there are two buttons on the right side with the top being a back button and bottom being the home button. The home button also opens up a list of the apps which you can scroll through by swiping up and down. While it’s pleasing to the eye and easy to scroll through, it’d be more useful if the most recent app popped up on top – it’s more of a smartwatch feature, but Samsung ‘s already gone halfway on that front, why not go a little further? 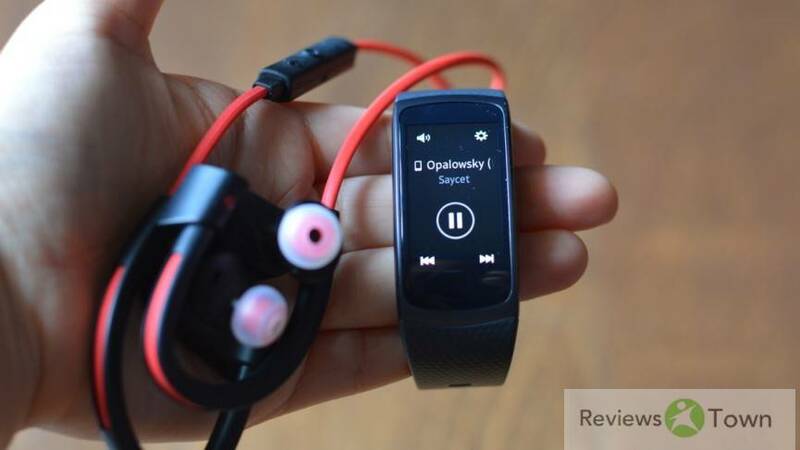 Aside from putting your own music onto the Gear Fit2, you can also use Spotify – you’ll have to download the app onto your phone and have it nearby to use it, though. From there, you can listen to the music through Bluetooth headphones, skip songs, shuffle, repeat, save songs, search for workout music, access playlists by albums or artists and select recently played. You can actually do quite a lot which makes me feel more forgiving about the fact that my phone still needs to be on me. When connected to my Amazon Alexa speaker through my phone, I’m also able to control it with the Gear Fit2 which is handy. 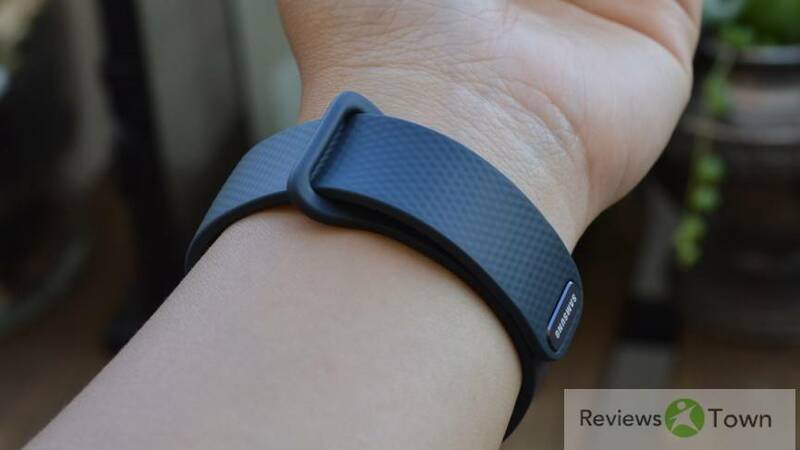 The app for the Fit2 is as bare-bones as you can get, however it does come with S Health. 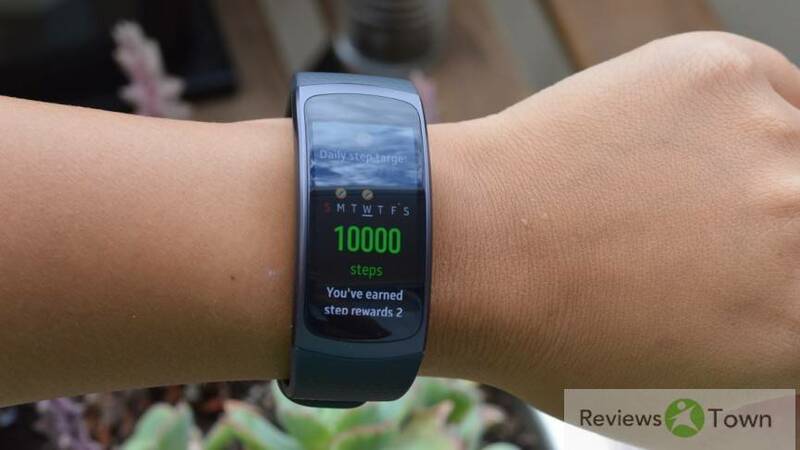 If you’ve used any other Samsung wearable, you’ll get the gist of it. Your steps, sleep and more are kept in one place so you can access whatever you want. 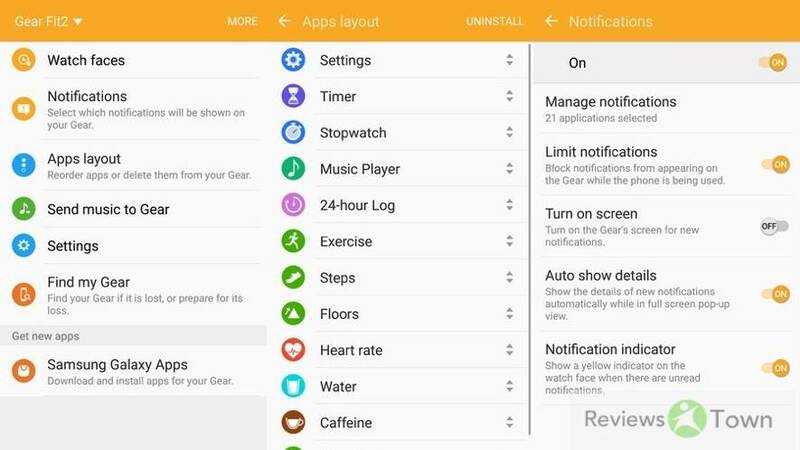 Then there’s the Gear manager app which holds the key to watch faces, specific apps and settings for the Fit2. In terms of other apps for the Gear Fit2 outside of its main ones? There aren’t many – yet. During the first week of the review process, there weren’t any watch faces or apps out, and now there seem to be 100 new faces and eight apps. A little meagre, but it’s still a new device. According to Samsung , the Gear Fit2’s 200 mAh battery should last up to three to four days, or five if you’re generous with usage. My time spent using the Fit2 involved a screen brightness of six, receiving and sending text messages, getting calendar, call, app and social notifications plus using it during exercise. With all that running, the Fit2 only lasted two days at most. Typically, I don’t have all my notifications on since I prefer to ignore Facebook, Twitter and Instagram, and I only have Slack on during work hours. I think by toning down the notifications, I could get two and half or three days – but that’s an experiment for another time. 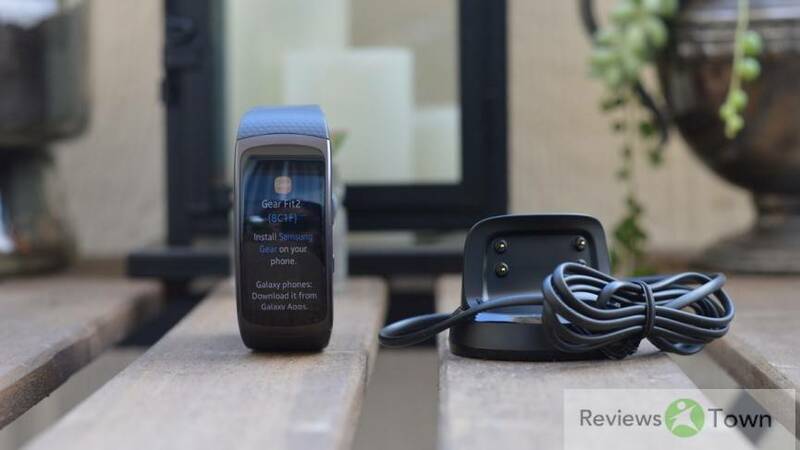 Gear Fit2 isn’t the mess Gear S was in terms of compatibility, yet it’s still sorely lacking in this area since it will only work with handsets running Android 4.4 and above. Most Android Wear devices have limited capabilities with iOS but nonetheless, it is still an available option. I’m hoping round three will let Apple users enjoy Samsung ‘s devices too.